As you play Pokemon GO, you’ll quickly accrue a sizeable army of tried-and-true battlers to help you take on even the most stalwart of gyms and fearsome of raids (and soon, rival trainers!) But most of those Pokemon unfortunately will not make good gym defenders. 2. Pokemon resistant/super-effective against Fighting. 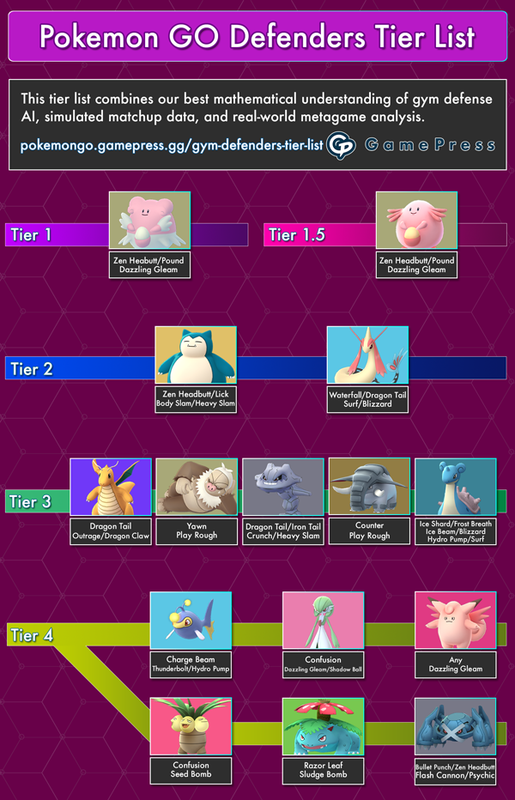 Blissey, Chansey, and Snorlax are all normal types, and Fighting is the primary counter to Normal. This means many gym attackers will be Fighting type. A flying, fairy or psychic type will force your enemy to swap Pokemon or whittle your defender’s health down slowly, either of which work in your favor. 4. Give your defenders fast-acting charge moves. Gym defenders can’t be slow-starters. They may only have a few seconds to even hit their opponent, so 2- or 3-bar charge moves are the name of the game. I love using my Exeggutor because of his fighting resistance, 3-bar charge move and heavy-hitting fast move. You should also look up a Pokemon’s various available fast moves on GamePress and consider which moves generate energy fastest. 5. Pick rare but powerful species that will entice your teammates to feed them berries for that 1% chance of earning a candy per berry. A fed Pokemon can keep its motivation high without your help, and certain species like Meltan and Salamance are sufficiently rare that your teammates will likely pick up the slack. Milotic is considered the 4th most powerful Gym Defender despite being Water-type, in part because Feebas candies are so rare that people shower her with berries. 6. And last but not least, I need to pay lip-service to several niche strats that I don’t personally use, but I know people who like them. · Slaking is a below-average gym defender, but his insane 5441 max CP means he can single-handedly stop a gym from looking tiny and vulnerable if he has the barest of additional defenses helping him. some people think this scares away potential attackers making the gym look like a tough fight, but it’s never stopped me personally. · On the other side of the coin, Pokemon who are below 300 CP lose motivation the slowest. If you suspect your Pokemon will be stuck draining motivation for quite some time before someone attacks them (perhaps its midnight at a local park) you might want to put a tiny pushover ‘mon who dissuades attackers that don’t want to have to fight him 3 times to knock him out. This is the rationale behind the infamous Shuckle gym strat. · Finally, bizarre gimmick rares are more successful than they should be at attracting teammates to feed them berries. Unown, hatted Pichus, rare shinies and foreign regionals are all good ways to get people to click your Pokemon and feed them a berry just to see the animation. And that’s all! Honestly, this may sound like a lot, but there’s honestly not that much to building decent gym defenders. The real complicated stuff shows up when crafting gym attackers. Luckily, I’ll be covering that in my next article! Until then, have fun and keep on catching!